“I’m still having a hard time,” I confessed to my friend, Nancy. My husband, Chris, and I had sent our “baby” off for his first year of college several months before. “You need to start focusing on the benefits of the empty nest,” she said. That was how I learned about Bradenton, Florida. Nancy described it as a sunny, walkable town full of engaging art and mouth-watering dining options. A perfect escape from our overcast Michigan weather and an ideal introduction into the benefits of an empty nest. So, Chris and I flew off for our first kid-free vacation in years. Our first day in Bradenton began with a visit to the South Florida Museum. 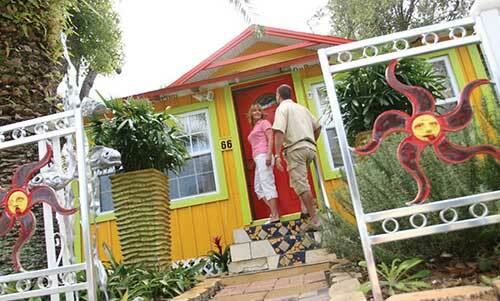 Its collection of artifacts and antiques brought to life the history of Florida’s Gulf Coast. Chris was especially intrigued by the historic weapons exhibit and a 600-year-old canoe made from a single tree. It was great fun visiting the aquarium, which is also a rehabilitation facility for injured manatees. We observed these adorable creatures both above and below the water, and watched them munch on meals of romaine lettuce, kale and carrots. 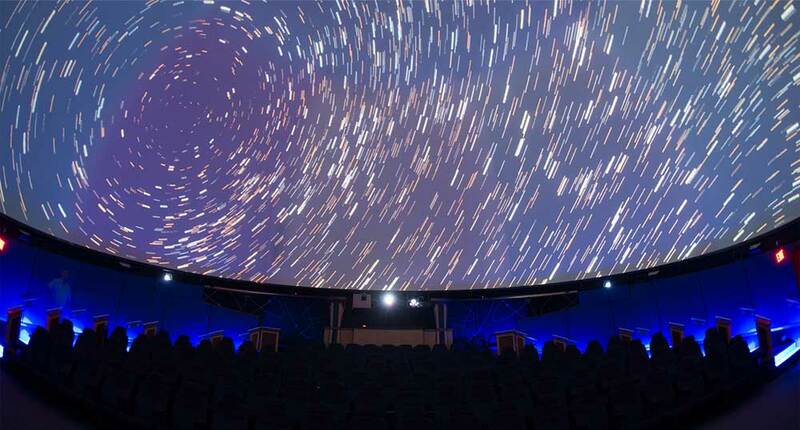 The highlight of our visit though, was the museum’s state-of-the-art planetarium. I loved the mesmerizing show, Journey to the Stars. The visual aspect alone was completely captivating, but the insight provided by the narration (excellently delivered by Whoopi Goldberg), had me completely engaged. Chris and I left the dome recounting highlights, and sharing our own commentary with each other about the yet unsolved mysteries of the universe. Afterward, we strolled down the charming brick sidewalks of Old Main Street, admiring architectural detailing on the early 1920s Mediterranean Revival-style buildings. I logged onto the Walk Bradenton mobile website, which Nancy recommended, and got fascinating insight into city sights, restaurants and abundant public art. Using it, we learned that the brightly colored 6-foot gecko we spotted perched on a nearby law office wall was one of several sculptures adorning downtown Bradenton buildings. And the gray-and-white Iron Block Building—built in the cast-iron style of architecture—was one of the best pressed-metal facades in Florida. The next day, we stopped to see historic LECOM Park, the oldest spring-training ballpark in the country, and home of the Pittsburgh Pirates. Babe Ruth, Roberto Clemente and Ted Williams once played in this classic stadium. With all that storied history, Chris commented about how cool it would be to return and watch a Pirates spring training session there. We moved on to explore Bradenton’s renowned Village of the Arts. This funky artist live/work community is filled with an eclectic mix of galleries, restaurants and specialty shops housed in colorfully restored bungalows from the 1920s and ’30s. We admired the 100-foot entrance mural honoring village founder, Herbie Rose, before roaming through the shops. At the Village Sharpening & Metal Art Gallery, Chris picked out a decorative, hammered copper fish to hang above his desk back home. While walking toward the Joan Peters Gallery, we spotted our next stop—Arts & Eats Restaurant and Gallery, an intriguing 1925 bungalow with a bright yellow awning. I’d made reservations though the mobile website, so we climbed the purple painted steps. Inside, live music was being performed, and the whole place exuded a warm, Greenwich Village-style vibe. Donna, one of the owners, seated us at a gorgeous mosaic-topped table that she’d created. We started with an appetizer of dates stuffed with feta cheese and pistachios, drizzled with a delicious orange glaze, followed by a fresh seafood tagine for me and Asian fried chicken served with an incredible medley of sauces for Chris. Were we too stuffed for dessert? No! We shared a slice of chef/owner Jim’s signature carrot cake with an incredible mascarpone cream and lavender honey that was to die for. We left the village fully satiated, and loaded up with one-of-a-kind artistic treasures that I couldn’t wait to show off to our friends. For our final day in Bradenton, we explored the Manatee Village Historical Park. Roaming around the well-preserved buildings immersed us in the pioneer days of Old Florida. Afterward, we had lunch at Drago’s, and were enjoying the view from our window when I noticed people walking past carrying brown boxes in their hands. When we finished, we investigated. We didn’t have to go far. Next door, we found The Farm House. When we stepped inside, the sweet fragrance of fresh-made doughnuts filled our noses. This is not a typical doughnut shop. Housed within the store’s rustic interior is a boutique shop filled with handmade furniture, jewelry, unique vintage pieces and a treasure trove of home decor items. We meandered over to the Riverwalk, eating our exquisite doughnuts and appreciating the soft Manatee River breezes wafting over us. We stopped to take a selfie, holding up the doughnuts we saved for ourselves for breakfast, to show our kids how much fun we can be. As I looked at our smiling faces on the screen, I reflected on how wonderful this trip to Bradenton had been. My friend Nancy was right. It really was the perfect place to begin the journey into our new normal—the rich, active (and delicious) life of empty nesters. Discover more Bradenton area treasures.